The club has very close ties with Keio University Karate Club, the oldest university karate club in the world, founded in 1924. CUKC has exchanged tours with the Keio team many times in the past and members of both will tell you how rewarding the experience is. At the end of each trip, the two teams traditionally participate in a friendly competition, which in recent years has been very closely fought. The club's next trip to Keio is planned for Summer 2015. This is in early stages of preparation, but check back for more details! If you are aware of any missing visits, then please get in touch with the webmaster. 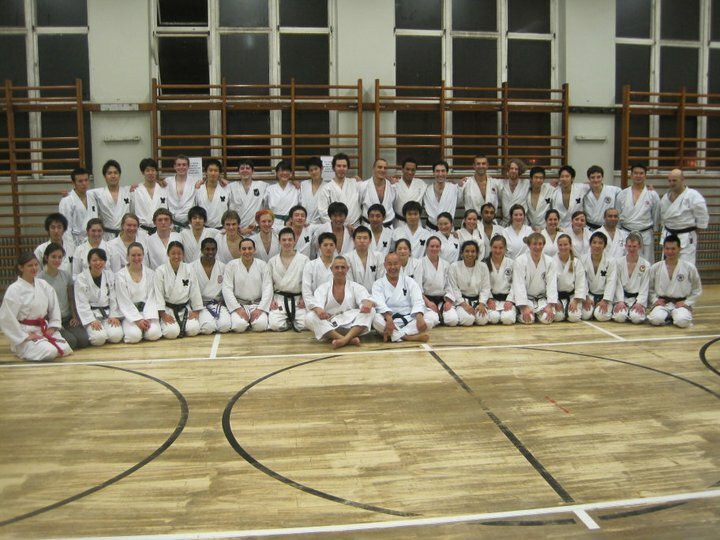 In February 2011, a team from Keio University in Japan visited Cambridge to train and compete alongside CUKC for a week. Arriving on the Sunday, the first joint session was held the next day and taken by the Captain of the Keio squad. This was followed by training with our club on the Thursday so both teams were in top condition for the Northern Regions on Saturday and a friendly the following Monday. The week started well, with almost all of CUKC turning up to train on the first Monday. Although at first daunting, members of Cambridge Karate Club soon became accustomed to the session being in Japanese and amazed at how well the Keio team could control their legs whilst hopping. After the session, teams headed off for the first social of the week. Following Thursday's regular training alongside Keio, the next big event was Saturday's KUGB Northern Regions Championships. A fiercely contested victory from the North highlighted where Keio had their strengths and weaknesses, and brought out stunning performances from fighters from CUKC. Equally contested, the traditional friendship match between the university teams took place the Monday after. Three teams from each club fought head on head as CUKC aimed to maintain the winning streak. Determination won out and Cambridge was victorious in the B and C team matches, but a fantastic performance from Keio's captain tipped the balance in their favour. Following this performance the Keio team returned home, but not before celebration from both sides. We eagerly anticipate another beneficial visit in the future. View the photo album of the tour. © Copyright 2008 Cambridge University Karate Club. Valid XHTML 1.0 Strict and CSS 2.1.